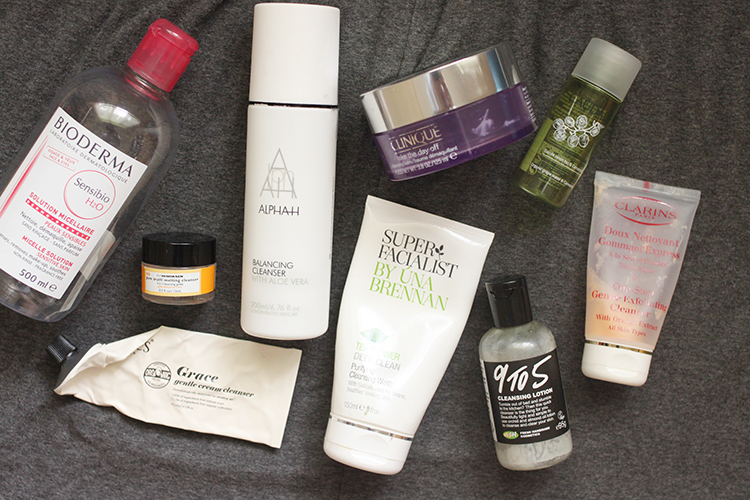 Yeah, I'm coming at you with another massive empties post because I don't have my life together enough to post these more often so they're probably always going to be huge. I thought the best way to do it was to split them into categories and I actually photographed them that way too to make life easier for everyone! I got through a 500ml bottle of Bioderma and I'm already using another, we all know what micellar waters are about by now and Bioderma isn't the most cost effective but it is ever so slightly better than all the others. 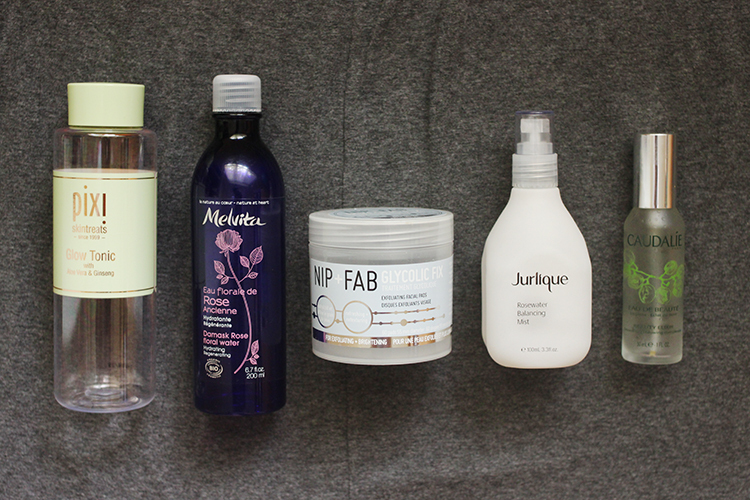 The Caudalie Micellar Water (mini) isn't bad, but I don't think it did as good of a job as Bioderma. If I got another mini I wouldn't be mad about it but I'm not going to go out of my way to buy a full sized bottle. Clinique's Take The Day Off is an excellent balm cleanser that I can't fault at all except to say that it's unscented which means that there's no luxurious plant oils to add to the experience of using it, but it's perfect if you have overly sensitive skin or if you prefer unscented products. It has a fantastic, smooth texture that melts into an oil on your face and breaks down your makeup with ease. I can't say the same for the Ole Henriksen Pure Truth Melting Cleansing Gelee (sample) though. I don't think it did a particularly great job of removing makeup, and texture-wise I prefer a thicker balm/oil rather than this "gelee" and any amount of water added to help the product spread further turns it instantly into a watery milk. Needless to say I'm not going to be buying the full size. Now for morning/second step cleansers, my favourite of the bunch is the Alpha-H Balancing Cleanser which I've been through probably three of. It's the perfect consistency (the Lush is thinner and the Antipodes is thicker) for a gentle creamy cleanser that never strips my skin or makes it feel dry. Plus Alpha-H has regular specials where you can get this cleanser virtually for free in a double pack with Liquid Gold so I'd hold out for one of those if you're also an LG OG. The Lush 9 to 5 Cleansing Lotion is a really good option if using vegan and/or cruelty free products is important to you. I prefer a slightly thicker consistency (lotion is the right word for it) but it did the job and I can't complain about it. 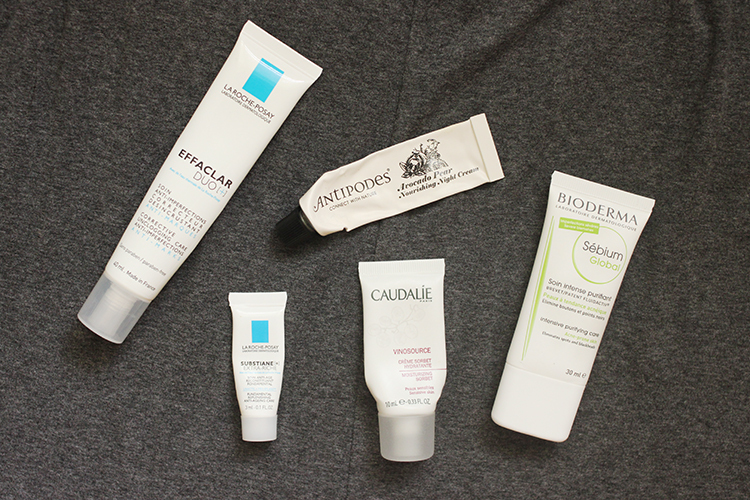 I really enjoyed the Antipodes Grace Gentle Cream Cleanser and would happily use this again. The screw lid packaging isn't the most convenient but the contents are lovely. I picked up the Una Brennan Teaflower Purifying Cleansing Wash in the UK and it's a really nice non-foaming gel cleanser that doesn't strip the skin, but I've decided I definitely prefer creamy cleansers over gels. I got the Clarins One Step Gentle Exfoliating Cleanser in a Clarins skincare set and I wouldn't have bought it myself as I don't really gravitate towards manual exfoliants or cleansers with SLS in them, but this is still a pretty gentle option. I actually kept this in the shower and used it on my decolletage because I find that easier than washing it at the sink like I would my face. I feel like that area of my body is deserving of something a little more special than a standard shower gel and I really liked it for that. I love the Pixi Glow Tonic and thankfully it's now more widely available than before, I've spotted it on ASOS, BeautyBay and apparently you can buy it in Sephora in Australia. It's a reasonably priced, effective AHA exfoliating toner and I find acid toning twice a day helps gently refine my skin texture, fade hyper-pigmentation from breakouts and generally keeps my skin looking brighter by speeding up cell turnover. I love using an acid toner and this one ticks all the boxes. In the same camp are the Nip + Fab Glycolic Fix Exfoliating Facial Pads except I don't think these are as effective, and with 60 pads in the container and two uses a day that's only one month's supply for $34.99 - I'll be sticking with the Glow Tonic as one bottle lasts me more like 4-5 months. The Melvita Damask Rose Floral Water is basically just rosewater which I decanted into a spray bottle and used as a second step toner. It doesn't really do anything special but it's a nice step, but I probably wouldn't buy this one again as I'd rather buy one that's already packaged in a spray bottle. One like the Jurlique Rosewater Balancing Mist which has the most beautiful rose scent, I've talked about this before and although I haven't repurchased it yet I'm sure I will one day. The Caudalie Beauty Elixir is a blogger classic, I've only been able to bring myself to drop the cash on mini bottles of this as the full size is so expensive for what it is, but it smells amazing and I've definitely got another mini in my backups drawer. 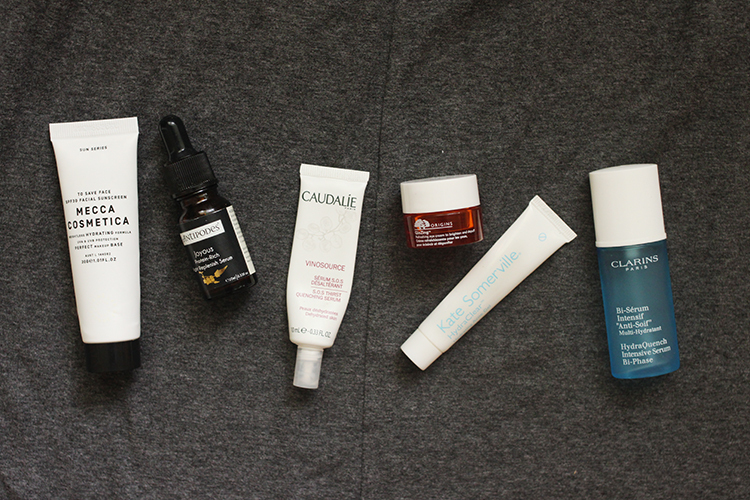 I'm not super loyal to any particular moisturiser and to be honest I'd prefer to spend my serious cash on a good serum and/or oil and get by with a simple moisturiser as they don't really do that much except lock everything else in and keep you hydrated. I have been through my fair share of La Roche-Posay's Effaclar Duo+ though, which is sort of a moisturiser but sort of an everyday acne treatment. You've probably all heard about it before, but it contains niacinamide and salicylic acid so it generally helps keep breakouts at bay and fade the hyperpigmentation they leave behind more quickly. It's not the most hydrating thing out there but I'll often use this with an oil on top (at night) or in the mornings when I don't want anything too heavy under my makeup. Did you know that Bioderma has an equivalent product to the Effaclar Duo+? I never hear anyone talk about it, but the Bioderma Sebium Global Intensive Purifying Care is also an everyday moisturiser that contains salicylic acid to fight acne. I found it slightly more hydrating than the LRP version and it a nice choice if you can't find the other or if you feel like trying something new. The Antipodes Avocado Pear Nourishing Night Cream (mini) came along with the Antipodes oil I'll be talking about below in a mini double pack and although I LOVE the oil, I found this a bit too heavy for my skin. With a shea butter base, I'd say it's more suited to those with mature or really dry skin, so I mostly used this on my decolletage. The Caudalie Vinosource Moisturising Sorbet (mini) is pretty much the opposite though, it's super lightweight and has an almost mousse-y texture. The mini size was fine but I'm not in love with it and probably wouldn't buy the full size. I did quite like the sample of the La Roche-Posay Substiane+ Extra Riche I tried though. Despite the name it didn't feel too heavy or greasy on the skin and was fine to use even under makeup. The Substiane range doesn't seem to be easy to find though so I guess I won't be using it again. The Mecca Cosmetica To Save Face SPF30 (30ml) is easily the best facial sunscreen I've tried and I'm onto my third mini tube now and will probably just buy the 100ml next time. It's lightweight, non-greasy and doesn't interfere with your makeup and it's a great option for men too. As I mentioned above, I love the Antipodes Joyous Protein Rich Night Replenish Serum (mini) and after trying it out I bought the full size. Despite it being called a serum, it's a beautiful facial oil that leaves my skin feeling plump and hydrated without being too heavy for my oily skin, and most importantly it doesn't break me out. Another blogger classic, the Caudalie Vinosource SOS Thirst Quenching Serum (mini) is a nice hydrating serum with a really thin, watery texture. When purchasing a new serum these days I'd be more inclined to go for something packed with antioxidants, retinol or peptides, but this still gives a nice boost of hydration and it's a good option for mornings because it's so light. Like moisturiser, I'm not wed to any particular eye cream but there was a fair bit of buzz around the Origins Ginzing Eye Cream (mini) a while back. It's nice enough but didn't seem to do anything more or less than other eye creams I've tried. For whatever reason I wasn't aware that the Kate Somerville HydraClear Hydrating Acne Gel (mini) is meant to be an acne treatment/moisturiser along the lines of LRP Effaclar Duo and I used this little sample as a spot treatment. I found it to be somewhat effective but not enough that I was planning to repurchase it, and definitely not now that I know I wasn't even using it right - oops! I got the Clarins HydraQuench Intensive Serum (mini) at the same time as the cleanser I mentioned above, and I found by about halfway through this little bottle I really quite enjoyed it. It's a bi-phase serum like a lot of eye makeup removers where you have to shake it so the watery and oily parts mix together, and I found to be pretty hydrating and not as heavy as a straight facial oil, so it was still suitable for day or nighttime use. I probably won't buy the full size as hydration isn't my main skin concern but if I end up with another mini I'll definitely use it. Obviously I don't finish up anywhere near as much makeup as I do skincare because I use different makeup every day, while I use most of my skincare consistently twice a day, but I did get through a few things. 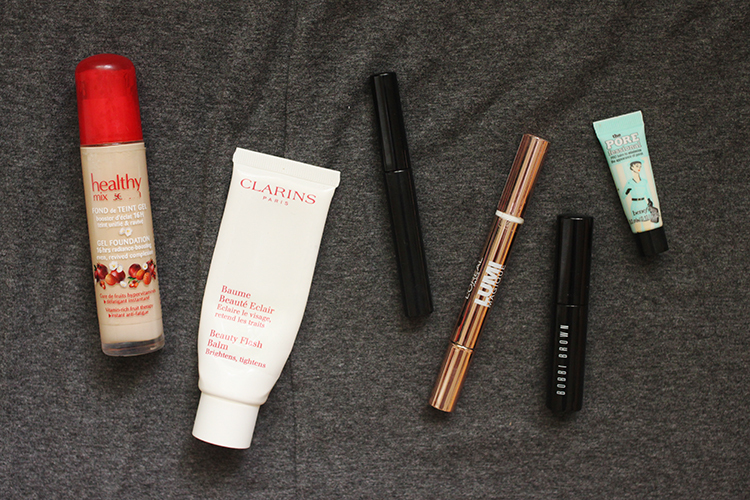 First up is one of my all time favourite foundations, the Bourjois Healthy Mix Serum. I've been through at least 3 bottles of this and I've got another one open now. It has a gel consistency and I haven't found much else like it on the market outside of the Marc Jacobs Genius Gel Foundation which I also like a lot. This has a really natural, skin-like finish while still offering medium coverage, and although it's not a long-wearing foundation per se, it still lasts pretty well on my oily skin, and I find that if my oil comes through it can be blotted away without the foundation going patchy and looking like a total mess. I'll pretty much always have a bottle of this in my stash. And the same goes for the Clarins Beauty Flash Balm. This product is marketed as a bit of a skincare/makeup hybrid, and while I don't think it's anything spectacular as far as skincare goes when you compare it with other products on the market, I do really enjoy it as a primer. I know it sounds gimmicky, but it has technology in it that temporarily tightens and firms the appearance of your skin as it dries down, so it's best to spread/pat the product on and not work it into the skin too much. I also find it helps with oil control a lot more than most other primers on the market, and I think it'd be great for dry or mature skin and anyone who likes their skin to look radiant - I find it really helps me walk the line between glowy and shiny and I love it for that. I've talked about my feelings on liquid liner before, and the NYC Liquid Eyeliner is everything I look for. Really dark, matte and doesn't move at all throughout the day. The only thing I can complain about is it's not easy to find. I only know of one place to get it shipped to Australia (linked) and it costs $8 instead of $2.99US. One tube will last you about 6 months though, I bought 3 tubes home from the US in November 2014 and I'm still on my second one, but once I'm on the third I'll definitely be buying more backups and I'd happily recommend it to anyone looking for a reliable liquid liner that never smudges, fades or goes patchy throughout the day. There are a lot of illuminating/highlighting clicky concealer pens around but as far as drugstore options go I think the L'Oreal Lumi Magique is my favourite. I haven't repurchased it because a) I need to work on finishing up more concealers because I have way more than I need, b) it's $27.95 in Australia which is ridiculous, and c) highlighting pen concealers aren't an absolute must for me. But if I finished up more of my concealers and spotted this on sale I'd happily pick it up again. Because mascaras have a pretty short shelf life I tend to use them one at a time, so I've only got one which is the Bobbi Brown Smokey Eye Mascara (mini). I'm not obsessive about mascaras like some people are but I remember liking this and it didn't transfer or flake below my eyes which is a common problem for me, but I also didn't fall in love with it and wouldn't get excited over a full size. And the same goes for the Benefit PoreFessional Primer (mini) - I know this is a cult product but it's just not right for my skin. I found that it filled in pores but did nothing for oil control which is what I need a primer to do, so although it may be wonderful for some people it didn't really work for me. I am the laziest person ever when it comes to moisturising my body, probably because getting heavy body butters and the like on my hands means I then have to go and wash them and that's *slightly* inconvenient (lol @ me) but I found keeping a moisturiser like the Vaseline Intensive Care Spray Moisturiser in the bathroom meant I could I just spray it on after I get out of the bath or shower before I get dressed and that meant that it happened a lot more often. I hate the feeling of my hands being dry so I'm pretty big on hand cream. I keep one by my bedside, one on my desk at work and a small one in my handbag. 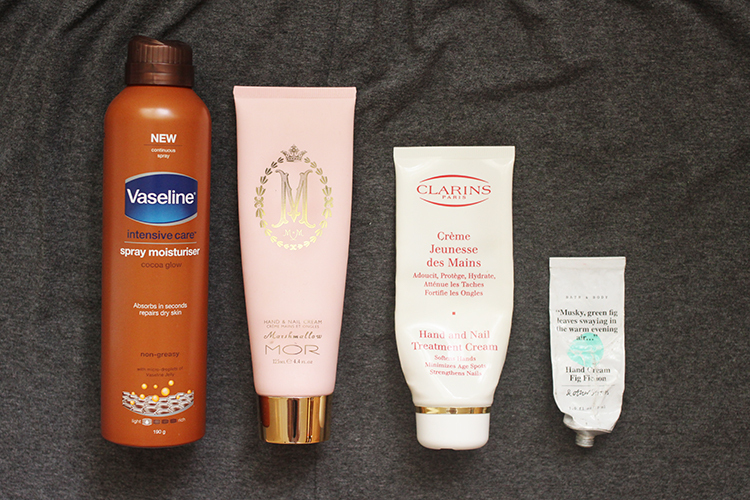 Of these three my favourite is probably the Clarins Hand & Nail Treatment Cream which is actually my mum's all time favourite hand cream. It's rich and nourishing but not too greasy or heavy, and it always left my hands feeling super soft. Although I wasn't in love with the scent, clearly the prettiest packaging has to go to the MOR Marshamallow Hand & Nail Cream. And the product was just as nice too, with cocoa & shea butter and macadamia & sweet almond oils in the mix. I also really liked the & Other Stories Fig Fiction Hand Cream which had what I'd call a creamy gel texture that was hydrating without being greasy.